Cuesta College announced Wednesday it is closing its small 60,000 gallon pool to make emergency safety repairs to the pool lining. 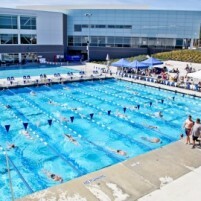 The small pool will be closed indefinitely, Cuesta College officials said in a press release. The unplanned repairs have led to the cancellation of 270 classes taken by 606 patrons, the press release said. The announcement was made less than a week after CalCoastNews reported the campus used more than 35,000 gallons of water a day in the first quarter of 2015 than in the first quarter of 2014. A family of three in San Luis Obispo uses an average of 5,200 gallons a month. Last week, Cuesta College Director of Facilities Terry Reese said the campus has been aware that both campus pools have been leaking for about six months. Even so, Reese said the pool liners would not be repaired until December. Reese also said he did not know if cracks in the lining are contributing to the water loss and that in about three years, the goal is to replace both the 650,000 gallon pool and the 65,000 gallon pool. Does anyone know where the water is going? What happens to it? Who is responsible? Government agencies seem to be the worst offenders. The big pool has been severely leaking for years and Cuesta has known all along. They have even drained the pools directly into the nearby creek. Unfortunately the latest crack in the smaller pool was known for weeks and nothing was done to repair it putting many children and seniors out of they’re paid for summer activities with no notice. 270 classes by 606 patrons. What does this mean? What is a patron? Apparently not a student. What period of time do these 270 classes cover? Could it be that all they offer is swimming classes? Of course there is no “we” in this, just check out the lawns of fire departments, police departments, city officials, anything that benefits “them”, no cuts on water, but certainly dog and regular parks, anything that would benefit “us” all being cut. Just a FYI, I drove by the AG FCFA station the other day, looks like the grass is gone. If CCN doesn’t report on this, Cuesta gets its bond money, the classes continue which means $$$, and nobody is the wiser while we watch our lawns die. There is no “we” in this. There is “them”, the self-entitled, doing what they want regardless of any moral compass, and the rest of us trying to find our way while we pay for their salaries and self-centered management. And of course, KSBY was right on time reporting on this, a week later.